We carry out a range of everyday electrical tasks, such as replacing light bulbs, plugs and fuses, replacing socket outlets, switches and ceiling roses, installing an extra plug socket, changing normal light switches to dimmers. Please note: We do not undertake to install consumer units or 3 phase wiring. These tasks require NICEIC registered electricians. 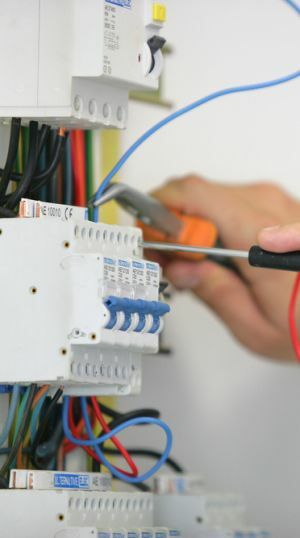 For complicated electrical work, including installations, we use dedicated, specialist electricians. If required, we will bring NICEIC registered electricians to provide you with a Building Regulation certificate (charges may vary). Please be aware that any major electrical work undertaken on your house requires full certification by a recognised electrician. London Handyman Electrical Services understand the importance of having a well maintained property, it is in essence one of the top factors that will determine the value of a property on the market. London Handyman Services offers a property maintenance service that will ensure any work carried out on your property is done with a very high level of professionalism at highly competitive rates. Excellent job. We are extremely happy and would recommend London Handyman and the work of your handymen to everyone. I was recently faced with the challenge of getting my home ready for sale. London Handyman installed new sinks, fitted new light fixtures, fixed small leaks in the shower, and patched up a few blemishes in my walls caused by a faulty window covering. If you're faced with home improvement or repair tasks, and don't have the time or the ability to deal with it, I would give London Handyman my highest recommendation.